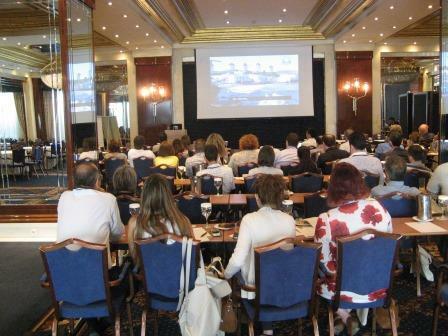 45 representatives of the Hellenic Coast Guard, governmental agencies, Protection & Indemnity Clubs (P&I), Marine Consulting Companies, Maritime Lawyer Agencies and Universities attended a one-day Kill•Spill Training Workshop on 29 July 2016 in Piraeus. The event was co-organized by the local Kill•Spill partner EPE, and the project coordinator. The practicioners and experts presented the current practice and challenges of oil spill response actions. The scientific speakers shared their findings on the effectiveness of bioremediation agents. Bio-based surfactants and bio-stimulants such as provision of nutrients or oxygen were showcased as promising approaches to speed up naturally occurring biodegradation. During the round table discussion, the best time for the application of bioremediation agents at an oil-spill was raised as one key question. Further, the approval of new products by the relevant authorities was recognized as an issue. The Hellenic Coast Guard judged the Workshop as informative and very helpful. It provided new insights as to better decide on potential future licenses for application of bioremediation agents during an oil-spill incident.